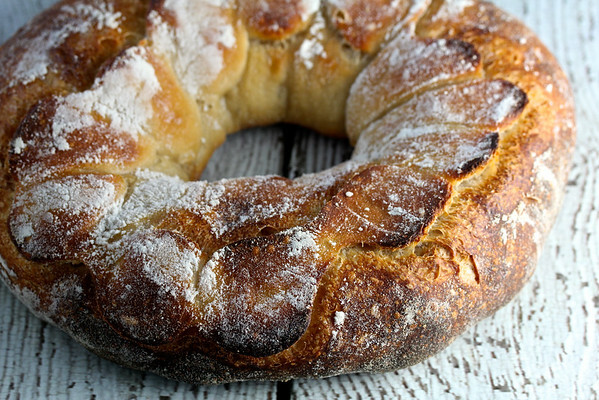 I did the happy dance after making this Couronne bread. 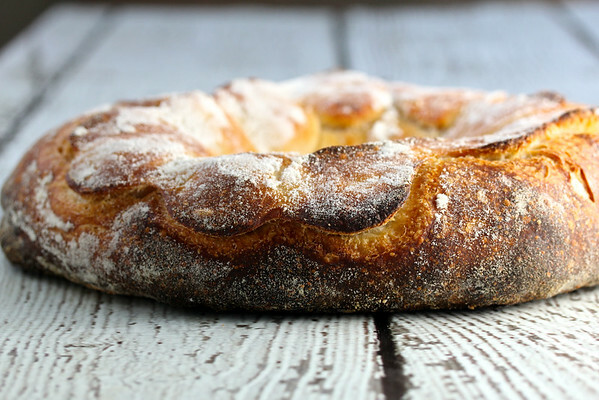 The mixed starter dough may take a weekend to make, but it is so totally worth it. 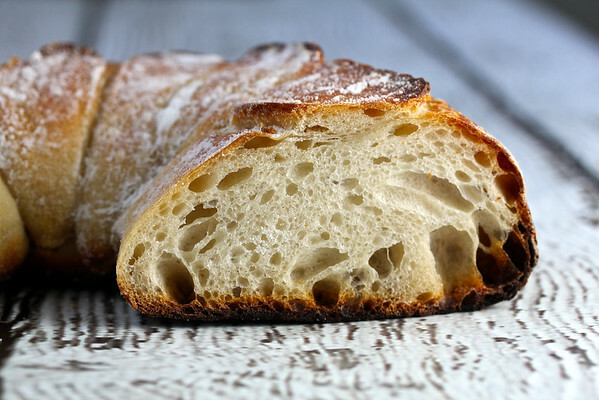 The resulting bread is crusty, crusty, crusty, and the soft interior is filled with the uneven holes for which bakers of rustic loaves strive. 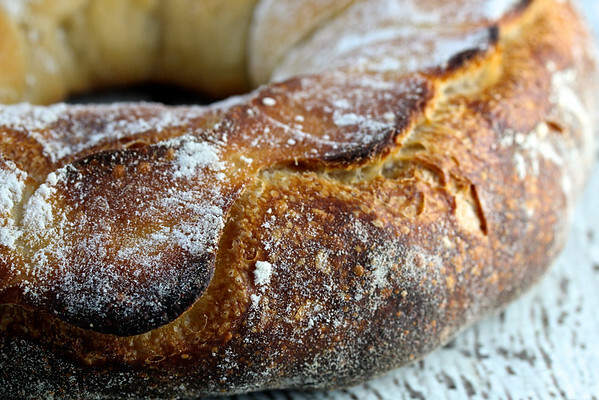 The recipe was contributed by Steve Sullivan, founder of Acme Bread Company, one of the pioneers in the artisan bread movement, to the PBS Series, Baking with Julia, and the resulting book, Baking with Julia, written by Dorie Greenspan in 1996. This dough begins with a small piece of leftover bread or pizza dough. I used used a piece of firm starter that had been sitting in my refrigerator for a couple of weeks from this bread. This is called the "old dough starter." About 8 hours later, the starter is fed again, and allowed to rise. The dough is "mixed method," in that it also includes a small amount of instant yeast in the final dough. There are a lot of steps to creating this dough, but the resulting dough is simply amazing and a dream to work with. 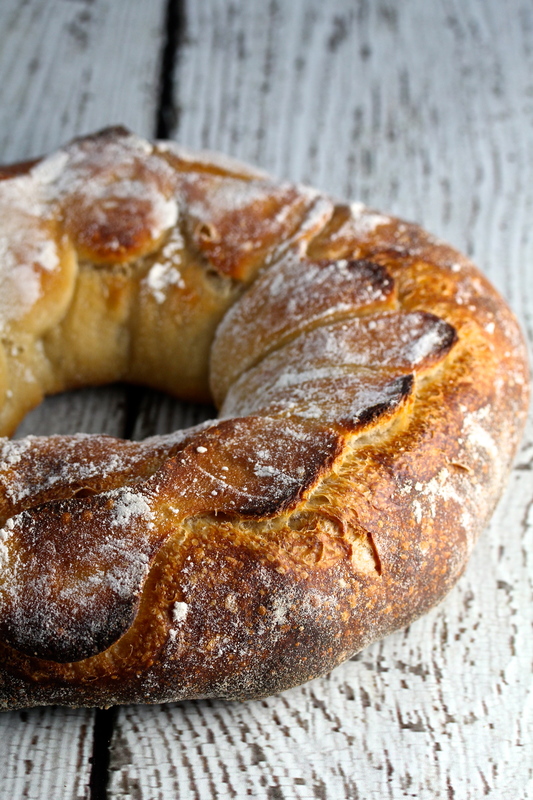 Once you've made the dough, you can make baguettes, wheat stalks, pain fendu, boules, walnut bread, or this couronne. To create the hole in the middle of the dough, you plunge your elbow into the center of the shaped dough (Yes, I did it). The top of the couronne is decorated with a string of "pearls" made from extra dough. My pearls got a bit off kilter as the dough was rising, but that's why they call this bread "rustic," right? Break up the old dough into pieces and add them to a medium bowl. Add the water, and let sit for about 5 minutes. Add the flour and mix with a dough whisk or spoon. When the dough gets too stiff, remove it from the bowl and knead by hand until the flour is incorporated. Place it back into the bowl, cover with plastic wrap, and let it rise in a warm place for about 8 hours (after the 8 hours, I refrigerated this starter until the next morning). Mix the second starter the same way you mixed the first starter. Let rise for four hours, and then refrigerate for 1 to 8 hours (I refrigerated mine for 1 hour). In the bowl of a stand mixer, add the water, the yeast, and the second starter pieces. Let sit for 5 minutes. Add all of the flour and mix with a spoon to just incorporate. Mix with the dough hook on low to fully incorporate the flour. Let rest for 10 minutes. Sprinkle the salt over the dough. Mix on medium to medium high for about 8 minutes. Place the dough into an oiled bowl and cover with plastic wrap. Let it rise for 90 minutes in a warm spot (about 85 degrees F). Gently stretch and fold the dough over itself from all four "sides," and let it rise, covered, for another 45 minutes. Take a 10 inch cake pan or springform pan and place a small (3 to 4 inch) bowl upside down in the middle. Cover with a tea towel, and rub the towel with flour. Cut off a 5 ounce piece of dough. Pat it into a rectangle, fold it over itself several times to develop tension, and roll it into a small log. Cover and set aside. Shape the rest of the dough into a rough ball. 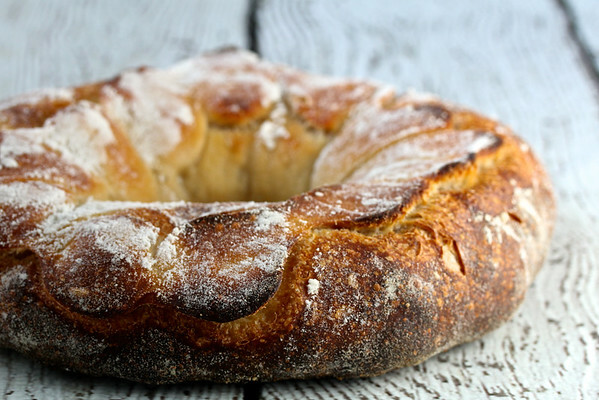 Plunge your elbow into the center of the dough to create a hole. Using a floured hand, continue to expand the hole. Cover the dough and let it rest for 15 minutes. While the dough is resting, make the "pearls.' Roll the rope until it is about 24 inches long. Using the side of your hand, indent the rope by sliding your hand back and forth every inch or so. Place the "pearls" into the basket, circling the small bowl. Place the rest of the dough, flipping it over (very carefully) on top of the "pearls." Cover and let rise for about 90 minutes. Place a pizza stone in your oven, and preheat it to 450 degrees F. Set up the oven for steam or place a large metal bowl over the pizza stone (this is what I did). When the dough is ready, place a piece of parchment over the cake pan, cover with a peel, and flip the whole thing over. Remove the cake pan and the tea towel. Transfer the dough to the stone and cover with the hot metal bowl. Reduce the oven temperature to 425 degrees F and bake for 20 minutes, covered, and then 20 to 25 minutes more, uncovered. The bread should be very brown, with an interior temperature of 200 to 210 degrees F.
I am participating in Tuesdays with Dorie. To see how other bakers fared, check out this link. Oh my goodness! This is gorgeous!!! I can just picture you using your elbow to make the hole. Too fun! Love, love, love this! Thanks so much Cathy! I wasn't going to, but then I decided to go for it! This dough really was a treat to work with. =) I loved this dough a log. Almost gelatinous. I tried every shape but the coronne-something about putting my elbow in the dough stopped me! Your loaf looks gorgeous! Very Nice! You are right, well worth all the steps. Gorgeous about describes it. Wonderful couronne. I have a piece of old dough sitting in the fridge and will borrow your idea and refrigerate the first starter. That way the timeline will work for me. So looking forward to making this after all the comments. Oh my God! This looks gorgeous! Makes me want to eat bread NOW!!!! It looks beautiful!!!! I can't wait to try your recipe! Excuse me for commenting so late. This looks fabulous! For the old dough in the first starter, is that from bread dough made the day before? Hi Elizabeth, it could be older than that. I used a week old firm (50% hydration) starter. I would say two to three days old is good for flavor. Karen, Thanks for choosing this as the BOM for January. I just made this bread for the second time. Your loaf and the photos look fabulous! I'm so glad you liked it Cathy!Thank you! Karen I would be doing a happy dance as well with this bread! Delicious! Wow, These are all looking delicious and also perfect for the kid's lunch item. Can I ask you how long I can store it in the breadbox? Thanks in advance for giving me the clarification. It's good for a couple of days, and then makes great toast.